On the advice of Wooderson from Dazed and Confused, I finally got around to trying a Top Notch Burger! 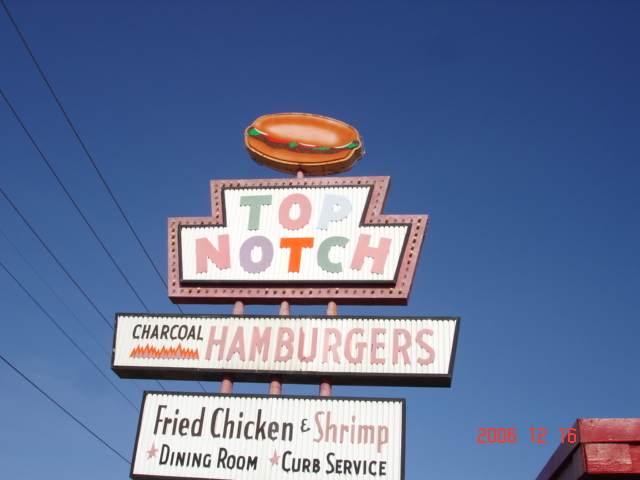 Top Notch has been serving Charbroiled burgers since 1971. From what I understand, it’s family owned and operated. It’s easy to see why this burger joint was chosen to be a backdrop for the 70’s inspired movie. It doesn’t look like much has changed since that time. You can choose to eat inside the restaurant or get your food delivered to your car by a carhop. We made the choice to eat inside since my husband doesn’t really like to eat in the car! We got to Top Notch Burgers at 1:30 on a Saturday afternoon and the place was PACKED! I got a burger and fries on this time around. Unlike in the movie, the fries were not soggy. They were actually quite crispy, just the way I like them! My husband couldn’t resist the fried chicken plate. He said that it was the best fried chicken he’s had in a long time! (They even have a veggie burger for those of you that are vegeterians). Overall, we had a great experience there and if we ever are on Burnet in North Austin again, we will probably return! If you go, make sure to bring cash. They don’t take credit cards, but they do have an ATM on site if you’re short on funds!